As The Indypendent reported in its last issue, Ragbir is a leading New York City immigrant rights advocate and executive director of the New Sanctuary Coalition. He has helped pioneer an “Accompaniment Program” for such check-ins that has taken on new significance under Trump because more people are being detained at what used to be routine appearances. Everyone exhaled sighs of relief and Reverend Billy and his choir ­— which Ragbir has sung with for the past two years — made a joyful noise. Soon Ragbir emerged, his arms linked on either side with Councilmembers Jumaane Williams and Ydanis Rodriguez. They expressed relief when he was allowed to leave about an hour later, but could not forget what they witnessed at the local office of Immigration and Customs Enforcement (ICE). Ragbir himself still faces what he calls a “guillotine over my neck.” Even though he has a stay of deportation in place until 2018, his deportation officer asked him to return on April 11 and to make efforts to get a travel document, one of the first steps in the removal process. Like millions of New Yorkers over the years, Ragbir came to the United States with a visitor’s visa and later acquired a green card. But ten years after his arrival he was convicted of conspiracy to commit wire fraud for a mortgage lender and served two years in prison before he was transferred to immigrant detention and released two additional years later. If he was labeled by his rap sheet, President Obama might have called Ragbir a “criminal alien” and Trump may use the term, “bad hombre.” But in New York City, his dedication to advocating for immigrants facing deportation has made him a respected authority on the topic. So just two weeks after his check-in, Ragbir was able to keep his commitment to appear on a panel about New York as a sanctuary city alongside the speaker of the City Council, Melissa Mark-Viverito. “This is the reality we are living,” Mark-Viverito said as she described one of her undocumented constituents who had recently faced harassment from her landlord but was afraid to report it despite efforts to reduce NYPD collaboration with ICE. The speaker used the event to outline policy changes the city has made “in order to limit people being run through the mill,” such as forging an agreement with local district attorneys to dismiss decades-old warrants, and making some minor offenses punishable by a summons, which is less likely to trigger deportation. Efforts to make the city a safe space for immigrants felt hollow to some in the crowd, such as Oscar Diaz of ICE Free NYC, who argued “there is no sanctuary city” because the NYPD’s broken-windows policing of poor and predominantly people of color neighborhoods continues to generate new criminal records. Weeks later, at a protest deep in Queens, Ragbir marched alongside several City Council members who joined hundreds in calling for the release of Ramesh Palaniandi, an immigrant from Guyana. Guyanese natives are the second-largest immigrant group in Queens. “There were so many people that the police allowed us to block off the street to walk for ten blocks,” Ragbir recalled. Palaniandi was detained at what was supposed to be a normal check-in on the same day Ragbir was cleared for another month, even though his appeals are still pending and he lived with his wife, who is a U.S. citizen. She was at the rally for Ragbir when her husband called to say they were taking him away. In the meantime he says people are also strategizing in preparation for his own fast-approaching meeting with a deportation officer. 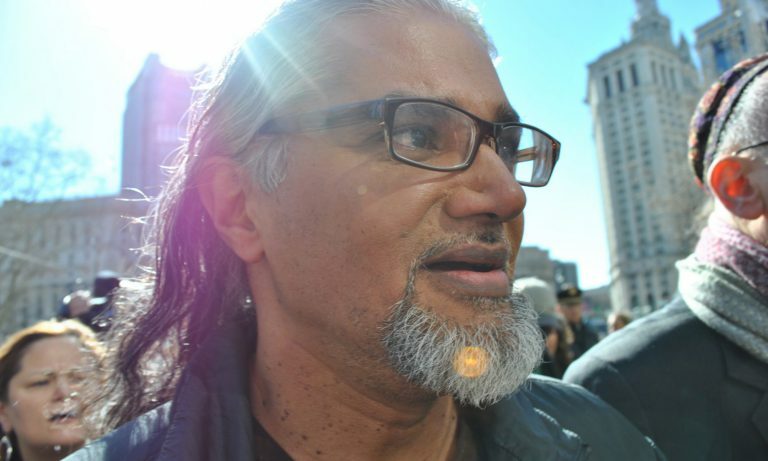 A recent email update from his defense committee urged supporters to “save the date of Ravi’s check-in: Tuesday, April 11th, at 8:15 AM in Foley Square.” Further plans will be posted on the New Sanctuary Coalition’s social media pages.